Fawn Meadow Wood Crafters, Inc.
We create and bring to life the decorative expression you desire by building the furniture and cabinetry that only custom can provide. We embellish on your ideas, work with your design team, or provide designs to your liking. 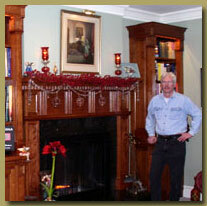 As shown by our Gallery, we do not limit ourselves by style or by the type of woodworking we do. The key to our success is giving you more than you were hoping for. Our goal is to give you the unique, one-of-a-kind kitchen, built-in bookcase, fireplace surround, or home office you are dreaming of. Furniture too! From occasional tables to bedroom sets, we strive to make your project exceptional. Everyone's taste differs, so why settle for something off the shelf? Our craftsmen are trained to use wood in a fashion that releases its natural beauty. If the project calls for exotic woods, that's what we'll use rather than substitute a cheaper species and staining it to look authentic. Our company is located in Bloomfield, New York, just outside Rochester. No matter where you live, you may contact us at info@fawnmeadow.com. We would be happy to discuss and offer our assistance for your next project.